A simple and mostly also the best way to create a PDF file is to convert an existing file into the PDF format. Creating a PDF directly is difficult because the PDF format was not developed for word processing, but as a final file format that can be displayed anywhere and always looks the same. Editing a PDF is therefore difficult and should not really be done. It is better to use Office files like Word as a basis, because you can adapt these files again and again and export them into the PDF format afterwards. Install the free PDF24 Creator. A PDF printer will be installed, with which you can convert any type of file to PDF. Everything that can be printed can be converted to PDF in this way. Open your file with a program that can open and print the file type. Print the file on the PDF24 PDF printer. 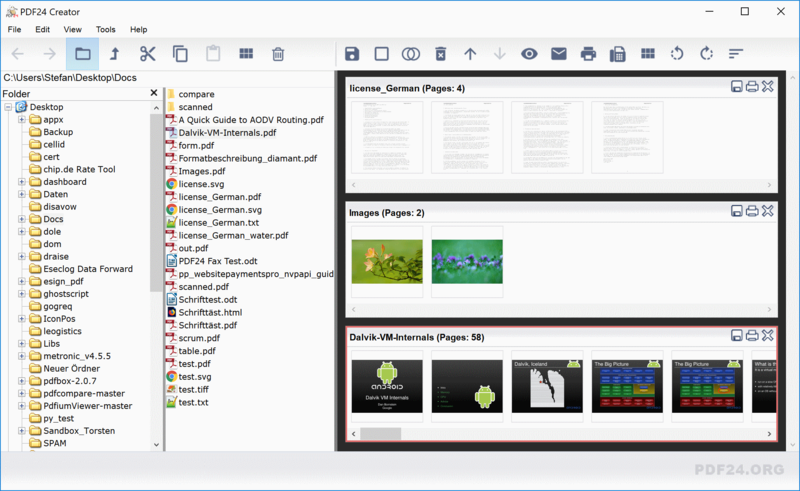 The PDF24 Assistant opens. Here you can save your newly created PDF file, process it further or send it by e-mail. Open the creator via the desktop icon, which is available after the installation of the software. Now drag all the files you want to convert to PDF to the right half of the window. PDF24 now automatically converts your files into the PDF format. The PDF printer is used and PDF24 automates the two steps "Open the file and print it on the PDF printer". After the files have been converted, they are displayed in the right half of the window. You get a preview of your files. You can now save your files as PDF and you have your PDF from your original file. If you don't want to install any software or need a PDF file quickly, you should take a look at the PDF24 online tools, because the online PDF converter in the PDF24 online tools makes converting to PDF really easy. Open the Tool to convert files to PDF in the PDF24 tools area. Click in the file selection box and select your file or files to be converted to PDF. Start the conversion to PDF as soon as all files have been loaded. PDF24 will then process your order and carry out the conversion. Depending on the number or size of the files, the conversion may take some time. Usually the results are available in a few seconds. The advantage of this online tool is obvious. It's easy to use, you don't have to install or adjust anything, just open the tool in your browser and use it. Converting to PDF couldn't be easier. Note: PDF24 treats your files very carefully and ensures that your files cannot be used and viewed by anyone but you. All files used in the online area are automatically deleted after one hour. PDF24 does not process your file and does not evaluate it. PDF24's automatic cloud service then converts your files in the email into PDFs and sends them back to you. You cannot convert a file locally on your computer because, for example, you have not installed a program that can convert this file to PDF format. You can also use the email converter on your smartphone, because it usually does not have the necessary programs installed to convert it to PDF. Files can contain viruses and malware, and reading them locally on your computer can infect your computer. By converting them to PDF, you can be sure that your computer will not be infected with malware. 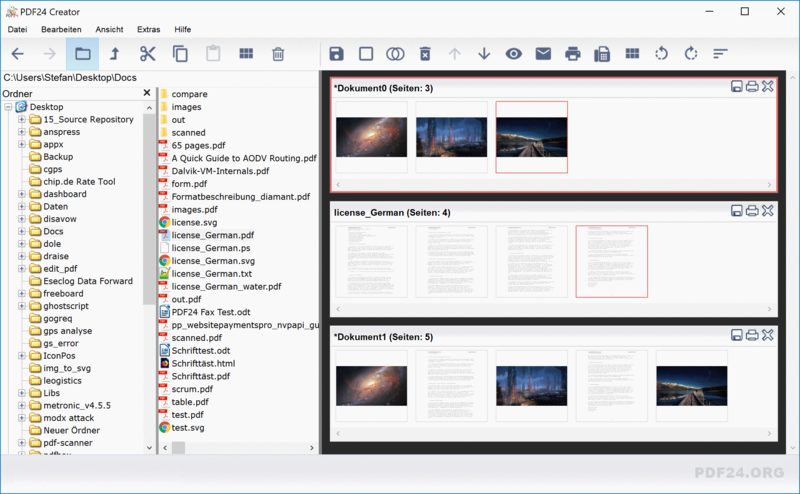 Merging files into a new PDF is also an elegant way to create new PDF files. The pages of files serve as the basis and these can be combined into a new PDF. PDF24 has the right tools for this and you can work online or offline again. Now drag files into the right half of the window to load them. You can use all files that the PDF24 Creator can convert to PDF on your system. A conversion is performed automatically if a file is not a PDF. You can now create an empty file using the corresponding icon in the toolbar, into which you then insert the individual pages. Now grab pages in the documents with the mouse and drag them into the empty document. Do this with all pages that should be present in the new file. Once your compilation is ready, you can save your new file as a PDF file. Tip: You can also merge entire files with the PDF24 Creator. Simply click on the connect icon in the toolbar and PDF24 will connect the files in the list to one file and display the new file for you to save. Open the appropriate tool in the PDF24 Toolbox. You can merge entire files or you can merge PDF files page by page. Get your files in the right order by grabbing and moving them to the right position. Now start merging or switch to page mode to merge page by page. Now save your newly merged PDF on your computer. Copy the URL into the input field and start the conversion. The result will be available a few seconds later and you can save your PDF file from the website. The conversion is done by PDF24 in the cloud. With web pages this is usually harmless, since these are accessible online for everyone. Since this tool runs in the browser, it also works under all common operating systems such as Windows, Linux, Mac or even on smartphones such as Android or the iPhone. In the overview of all PDF plugins you can find more plugins that you can use to create PDF files. With a scanner you can scan documents and save them as PDFs. You can scan any number of pages and attach them to a PDF. PDF24 helps you to do this by importing from the scanner and attaching to a PDF. All you need is the PDF24 Creator. 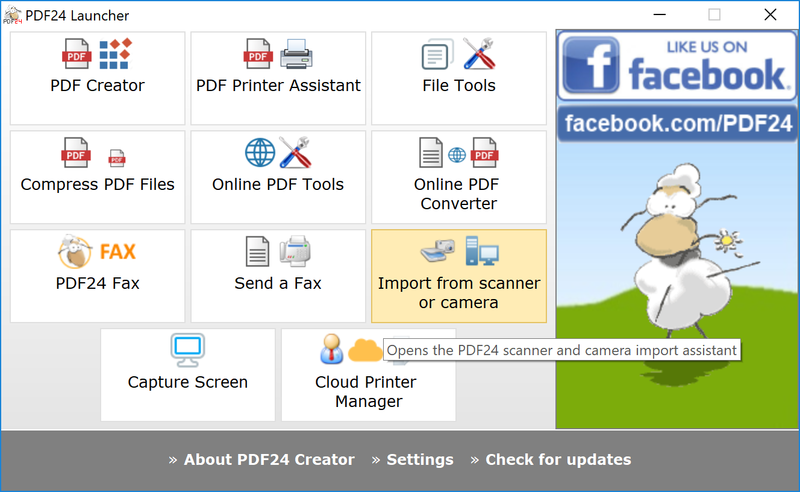 Install the PDF24 Creator, start the application from your desktop (double click on the sheep icon). Start the import from the scanner by clicking on the corresponding tile. Select the source and follow the scanner software's instructions to scan a document. Start the scan process to transfer the data to PDF24. Tip 1: If you are scanning a multi-page document, you can then merge the individual PDF files with the PDF24 Creator. Tip 2: The Creator, which you can also start via the launcher, can also import from the scanner. Click on File -> Import to do this. Here the documents are loaded into the right half of the window and here you have the possibility to merge single documents. Tip 3: With a feed scanner you can also scan several pages at once in one process, which are then all sent to PDF24. The PDF24 then creates a multi-page PDF file from all pages. 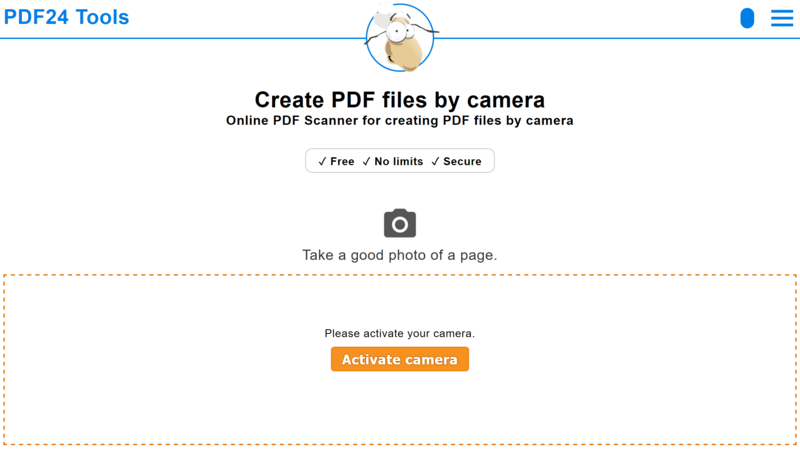 Follow the app's instructions by taking good photos of the pages in the document and attaching them to the PDF. Create your PDF once you have photographed all the pages. With a sufficiently good camera and a little practice, you get quite good results. A scanner to scan a document is no longer necessary this way. PDF24 gives you everything you need free of charge. PDF24 also enables you to create an online application as a PDF file. PDF24 helps you to compile an application consisting of cover letter, CV and attachments. PDF24 provides a suitable tool for this purpose free of charge. Open the appropriate tool to create an online application as a PDF file. Select your files in the three fields for cover letter, CV and attachments. Note: If you prefer to create your job application locally on your PC, you can also do this with the PDF24 Creator. The PDF24 Creator is not so much optimized for the creation of an online application, but you can also easily create an application with it. How can I create PDF files under Linux, on my MAC, under Android or an iPhone? The PDF24 Creator was developed for Windows and does not work on a MAC or under Linux. In this case you can and should use the online PDF Tools in the PDF24 Toolbox, because these tools work under every system, under Linux, Mac, on your smartphone and also under Windows. Are PDF24 tools really free of charge? Yes, the PDF24 Creator and the online PDF Tools are completely free and can be used by anyone, including companies. There are no licensing costs. Many users are enthusiastic and use PDF24's solutions every day to create millions of PDF files. Can I create a PDF file from any other file? With the PDF24 Creator you can create PDF files from any file you can print. If you can print a file, the PDF24 can convert it into a PDF. We have already shown you how this works above. The PDF printer of PDF24 makes it possible and this PDF printer converts everything you can print. PDF24 online PDF tools are not as powerful as the PDF printer in PDF24 Creator. With the online PDF tools you can convert common file formats to PDF, but by far not all file formats. PDF24 makes every effort to add new file formats if they become important. Can I edit a PDF file after I have created it? A PDF file is not suitable for subsequent editing. A PDF was not made for this and a transformation back into an editable format often does not work without losses in formatting. Therefore, it is always advisable to keep the original from which the PDF was created, so that the file can be subsequently modified and converted back into a PDF. In the PDF24 online PDF toolbox there is a tool for editing a PDF and here you can do basic things, but the complete editing of a PDF is not possible. With the online tool you can for example insert text, images and shapes or highlight text and paint directly in the pages. Can the PDF24 Creator also automatically create PDF files? Yes, this is possible. You can create and manage any number of PDF printers in your system and give each PDF printer a task that is executed automatically when a file is printed on the PDF printer. In this way you can e.g. automatically save a printout as PDF in a folder and at the same time attach another file or connect it to a company stationery. User-specific actions are also possible here. A PDF printer is a special virtual printer in your system that prints to a PDF file. So it is not printed physically on a sheet of paper, but into a PDF. With the PDF24 Creator you get a PDF printer with many extras and that is what makes this software so popular. Can I create a PDF file from images (JPG) or embed images in a PDF? Yes, this is also possible with the PDF24 Creator and with PDF24's online PDF tools. PDF24 is even really good at creating PDFs from images and creates beautiful borderless pages in the PDF that are also great for presentations. Are my files safe when I create a PDF online with PDF24? All files that you use with the online tools cannot be viewed by anyone other than you. The transmission of your files is protected by SSL. After using the online tools, your files will be completely removed from the PDF24 system after one hour. This means that you only have one hour to save your results. PDF24 does not evaluate your files and does not use them for any purpose other than that intended by the online tool used. How can I save an email as a PDF file? After that you can then save the mail using the PDF24 assistant. How can I convert a Word file to PDF? Install PDF24 Creator and print the Word file on the PDF24 PDF printer. Use the online PDF24 converter, which can convert Word files to PDF. Export a PDF directly in Word by selecting File -> Save As. Convert existing file to PDF format. Create a new PDF file based on pages in other files. For both ways you can use the PDF24 Creator and/or the online PDF tools from PDF24. PDF stands for Portable Document Format. A PDF is a platform-independent file format developed by Adobe Systems. It is independent of the original application, operating system, and hardware, and can be displayed faithfully on any system. Further information about the PDF format can be found on Wikipedia. When ever I am trying to make a pdf file with the help of pdf24, its not created as a pdf file but it is going to the printer direct for printing. How I can solve this issue.